In 1969, it was very, very different for Gay people. That's what we were known as then, within, Gay people -- one name, one community, one unity! The unexpected and unplanned Stonewall Rebellion of late June 1969 on a hot, late Summer night began when the New York City police and other "authorities", once again, raided The STONEWALL Club (no one called it an 'inn'), a Mafia-owned, two-part drinking and dance bar on Christopher Street near Seventh Avenue in New York City's Greenwich Village, New York. Unfortunately for the police, they thoughtlessly and disrespectfully chose the night of Gay icon Judy Garland's funeral that afternoon -- in the very same town: Manhattan, NY! "Judy" was the number one topic not only at The STONEWALL Club and every other Gay bar but virtually at all places throughout the World! Miss Garland was the top news story and on the front page of all newspapers all week! At The Stonewall it was extra poignant. Judy had been there! 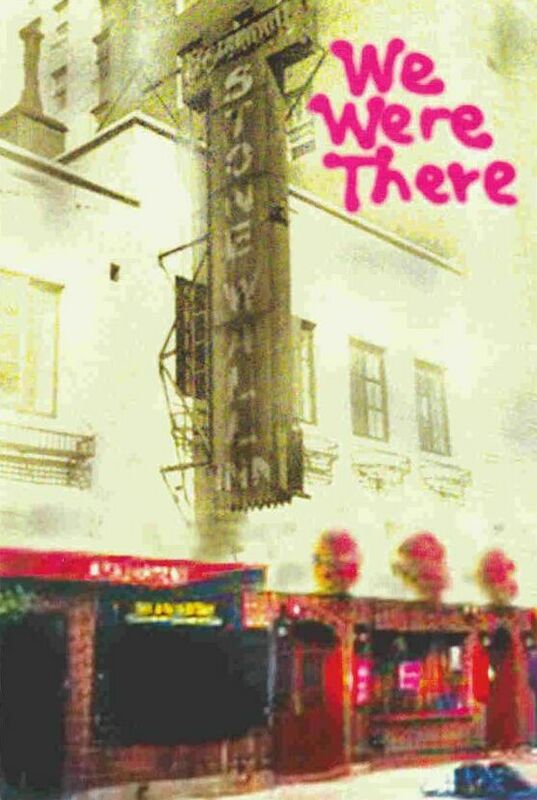 On Friday, June 27th, what began simply for The Stonewall's Gay patrons and their friends by the local police department as another routine "fag-bar" raid, later involving other law enforcement agencies such as the New York City Police Department ("NYCPD") abd the Tactical Police Force ("TPF"), quickly escalated into five, inconsecutive nights and early morning hours! Gay, Lesbian, Bisexual and Transgender ("G.L.B.T.") people and their supporters and friends decided to stand-up and fight back! As an assembled group we finally, bravely and harmoniously sang out loud and clear: "Stop!" Why did this Gay civil rights rebellion finally happen? Over the years continuing to the present time, there have been many instances of the NYCPD and legislators abusing the rights of G.L.B.T. people and their friends and supporters. These abuses continue -- though far less frequently -- not only in New York but... throughout the U.S.A. and the entire World at large! Back in 1969, "WE", as an inconsequential, unorganized and disrespected people, had absolutely no rights. And, policies were inconsistent. While it was 'illegal' for boys to dance with boys or men to dance with men, in contrast, girls could dance with girls and women could dance with women!? Thus, there was a double, illogical, discriminatory standard against all Gay males even within the imaginary walls of the G.L.B.T. community and far beyond! WE as a people survived by gathering at diverse and mixed places like The STONEWALL Club which, to many of the teenagers then, was the first place where we truly felt free. Free to be who we were! Free to dance with whomever we chose. Free to hear the special music we wanted. Others better felt the weight of the invisible shackles that tied us to clandestine, Mafia-owned and operated bars where the threat of abuse and possible violence was often present. But, in the wanning hours of Friday night, June 27th, it took away whatever security we thought we had solid. It was seemingly time for us to move on once again... to another Gay bar or Gay dance club or another dark street consciously hiding from the society that gladly took and absorbed from our culture whatever it could. Only beginning then, WE, as a Gay people, refused to take it anymore and spontaneously WE fought back! The signs -- subsequent to the first ambush night of the Stonewall Rebellion -- read: "Gay People", "Gay Power", "Gay Unity", "Gay Rights" and "Gay Marriage". Clearly, the only operative word was what it was: "Gay"! "STONEWALL" was a catalytic event for the G.L.B.T. Community! "STONEWALL", as it has condensedly come to be known, was ultimately a catalytic event for the G.L.B.T. community and eventually the World! This was the historical turning point for ALL of us leading suppressed lives (to one degree or another) in 1969 and for future generations of Gays, Lesbians, Bisexuals and Transgenders ("G.L.B.T."). We were tired of and angry at being victims and no one was going to succeed in abusing US as a group or a people ever again. At last, we demanded our independence and freedom. As of June 27th, 1969, also known as "Gay Independence Day", the term creatively coined by SVA's founder and wordsmith, Williamson 'Willson' Henderson, as a minority group, WE as a community immediately achieved the former! For several decades since, it has been an uphill struggle spiritually, politically, economically, legally and in every other sense. Our lives are still very much in danger and whatever liberty and freedom we have achieved is somehow at risk. Before the Stonewall Rebellion, there were other concerned G.L.B.T. folks who attempted to fight the system making minor in-roads, here and there. However, the effective 1969 Stonewall Rebellion made the public, the media and, most importantly, "US", realize that: We are a people and we demand our full rights generally as human beings and, particularly, as American citizens! In fact, at long last -- and only through the revolutionizing Stonewall Rebellion -- we symbolically achieved "minority" status. Question: Do you know what the top word in the STONEWALL sign says? Even though the Stonewall Rebellion took place in 1969 -- not 1869 -- the rebellion was not photographed or filmed by the media because they deemed it "unimportant". Likewise, they were not allowed (as in 'keep away')! Picture-taking was forbidden! Unless a treasure trove of forgotten images is one day unearthed, there will be endless speculation of what exactly occurred during those five, inconsecutive, steamy nights and early morning hours. We must preserve the Gay, Lesbian, Bisexual and Transgender ("G.L.B.T.") heritage we have before it is significantly and irrevocably lost! The National STONEWALL Rebellion Veterans' Association ("S.V.A.") positively and proudly represents Gay, Lesbian, Bisexual and Transgender ("GLBT") history, education and culture. The Executive Committee of the S.V.A. consists exclusively of real patrons of The STONEWALL Inn police raids from 1966 through 1969 and/or participants in the five-night, historic 1969 Stonewall Rebellion in Manhattan, New York. The S.V.A. focuses our multi-dimensional and diverse organization as a viable group of Gay men, Lesbian women, Bisexual folks and Transgender people. We strive for the facts and challenge the inaccuracies. The S.V.A. delivers the following: (1) education, (2) community-building, (3) support, (4) communication and (5) outreach as our primary purposes. Therefore, to educate, for example, we provide, on a regular and reliable basis, unquestionably unique, invaluable and factual information to individuals, groups, public officials, organizations and institutions via various means including mailings, phone calls, promotions and guest speakers. An expanded purpose under our rainbow umbrella of support consisits of homecare assistance, legal advice and financial support to help keep all of the actual Stonewall veterans active, healthy and united. Ensure that the STONEWALL Rebellion Veterans Association continues to be a significant, visible and activist force in the New York City area and far beyond. Allocate funds to assist Veterans of the Stonewall Rebellion who are indigent and need financial assistance with shelter, medical care, utilities, food, transportation, etc. Creation of a free or low-cost food/clothing collective for the needy in the Gay, Lesbian, Bisexual and Transgender ("G.L.B.T.") communities. Preserve our colorful and varied history by updating our archives consisting of videos and audio tapes and, of course, photographs and images of Stonewall Veterans and other notables of the G.L.B.T. communities. Maintain a consistent, strong, persistent and unified voice in politics and the media. Actively search and create a visual archive of biographies and images relating to G.L.B.T. movements throughout American history. Provide promotional information pertaining to the history of the Stonewall legacy to Gay and non-Gay media, public officials, other GLBT organizations and non-GLBT groups. Implement strategic initiatives to engage the G.L.B.T. communities viz-a-viz the "Stonewall" foundation. Issue press releases on current issues, matters and concerns of the GLBT communities as well as meetings, events and other activities of the S.V.A. Create a permanent Stonewall Veterans' Memorial Park at the current Sheridan Triangle in New York City's Greenwich Village. This idea was launched after the "STONEWALL 25" anniversary at the first subsequent S.V.A. monthly meeting in July of 1994. The S.V.A. has formally presented this project to New York City public officials, the New York City Parks Department and subsequently held meetings with them, various public officials and other GLBT groups on that SVA-sponsored plan. The artistic rendering of the Stonewall Memorial Park has been on display at many public events. 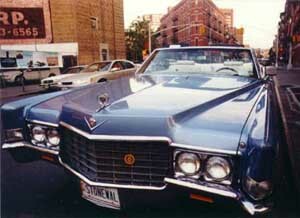 Proudly lead, in the historic and famous blue 1969 Cadillac DeVille convertible known as the "Stonewall Car", all New York metropolitan-area GLBT parades, marches and other public displays, exhibitions and rallies. Another responsibility of the S.V.A. 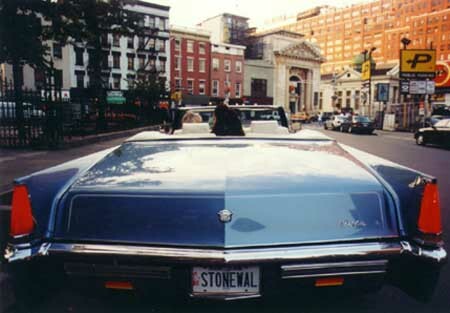 is to garage, maintain and insure the aforementioned SVA-owned "Stonewall Car" -- a visible, moving and valuable symbol of actual Gay history and real pride. Allocate funds to assist or, if needed, pay for funerals and burial expenses for Stonewall veterans and establish a central burial place at a local cemetery for Stonewall Veterans where their memory will be collectively honored by future generations. At this time, we have one limited plot accommodating four more in Westbury, Long Island. Maintain and promote the legacy of "Stonewall"! The STONEWALL Rebellion Veterans Association ("S.V.A.") is a not-for-profit, volunteer membership organization primarily for G.L.B.T. people and their non-GLBT friends, colleagues, relatives and supporters. The S.V.A. is registered with the New York State Charities Bureau since the Summer of 1969. The S.V.A. regularly publishes a newsletter entitled "STONEWALL Newzletta". The on-line edition is updated daily. There is an expanded print edition which is published quarterly. Press releases and other media communications by the S.V.A. are generated as warranted. The S.V.A. focuses on the continuing struggles of Gays, Lesbians, Bisexuals and Transgenderists. S.V.A. is a historical, cultural, educational, advocacy and politically-aware group with a long reach, great visibility and tremendous staying power. "No two eyewitnesses ever agree on every detail!" S.V.A. is registered with the State of New York Charities Bureau. "Search" enter: STONEWALL Veterans' Association or S.V.A. The S.V.A. is registered with the U.S. Internal Revenue Service. and community organization since 1969 in its proud 49th year! the 50th year of the STONEWALL Veterans' Association! National STONEWALL Rebellion Veterans Association.